Time for another look at one of the tools I’ve found that has come to be invaluable in staying productive whilst working online. 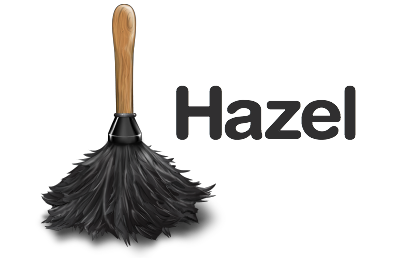 That is ‘Hazel’: a personal maid for your computer. Hazel is the most wonderful sort of productivity app, because you just set it up, and let it go. It carries on quietly in the background making sure that your Mac is kept clean and organised without you having to worry about anything. It’s so good in fact, that I had forgotten most of the tasks I had designated Hazel to look after, and so had to go back in and check for writing this article. I used to always get criticised by colleagues for having a desktop cluttered with all sorts of files – the tech equivalent of having a messy bedroom. The reality was that the desktop was the first place to pop up in the save dialogue, and it was handy to drop things there for quick access. I tried everything to get it under control, including monthly clear outs, and apps like desk drawer… eventually I just hid the icons on the desktop completely, so at least nobody else would know that they were there. The shame. 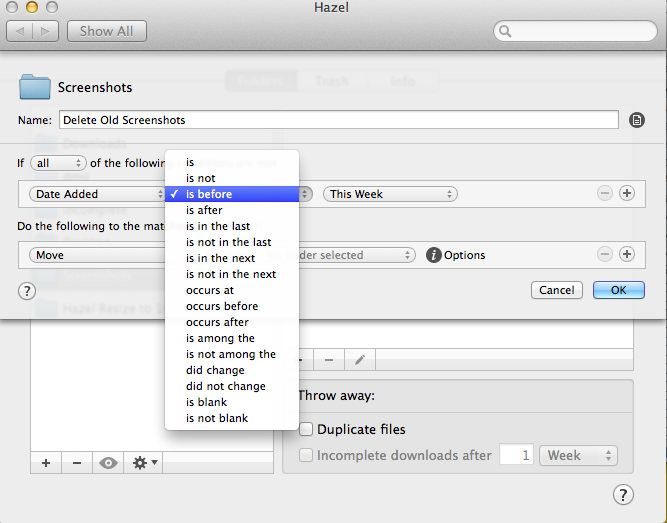 Hazel takes repetitive tasks like clearing up your desktop, and does it for you automatically. Ever since I hired in her help, my laptop has been more organised than ever before. 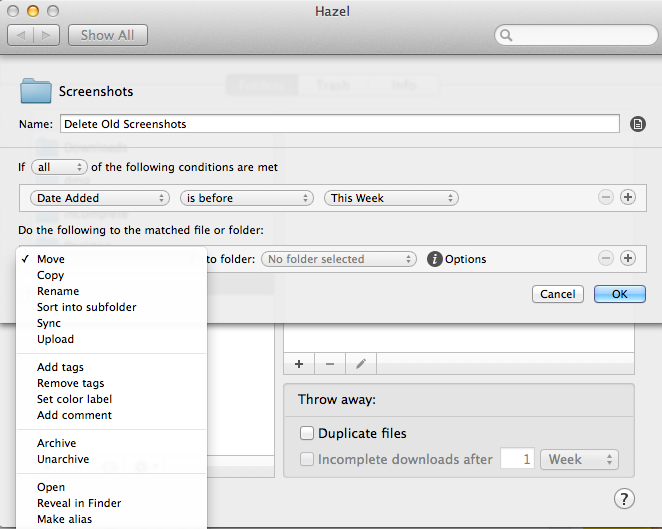 You choose the folder or location on your computer where you want Hazel’s actions to take effect on the left hand side, and then in the right hand side you set up the sort of things you want Hazel to do. What sort of things can you do? Let’s take the top example from the above image for a closer look: ‘Move Screenshots to Pics > Screenshots’. I take a lot of screenshots throughout the day. Some of them are useless, and should be thrown away eventually, but others are quick notes, or things I want to hang on to for later reference. The default OSX behaviour is to place them on the desktop, which is convenient… at first. It can be a real pain to go through and move them all manually into a different folder. In the above image, you can see that I’ve set up different criteria. 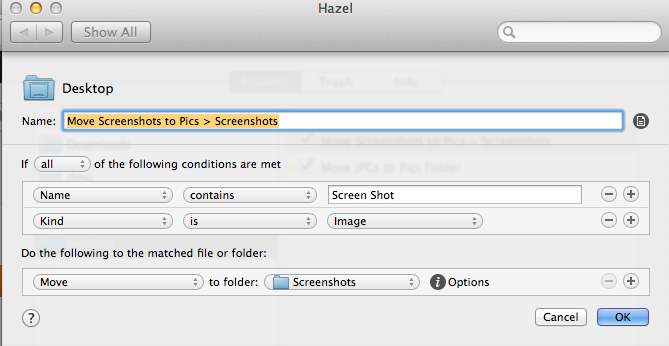 Basically if Hazel finds an image on the desktop that contains the words ‘Screen Shot’, it moves that file into a dedicated Screenshots folder under Pictures. That way I know where they all are, and periodically can go through them to see which ones I want to keep. The important thing is, they aren’t cluttering up my desktop, mixed in with all sorts of other guff. There’s all sorts of things we can have Hazel do here. In this case, if the screenshots have been added more than a week ago, we can get Hazel to Move them to the trash, or maybe Sort them into a subfolder named ‘old’, or archive them… or add tags to remind us to go back and clear them out. There’s all sorts of possibilities. You can get pretty specific about when, to make sure you target exactly the files you want. The above is pretty self explanatory, but essentially it means that I hardly ever have to look at the Trash again.Oh, and the secure deletion option is pretty sweet. 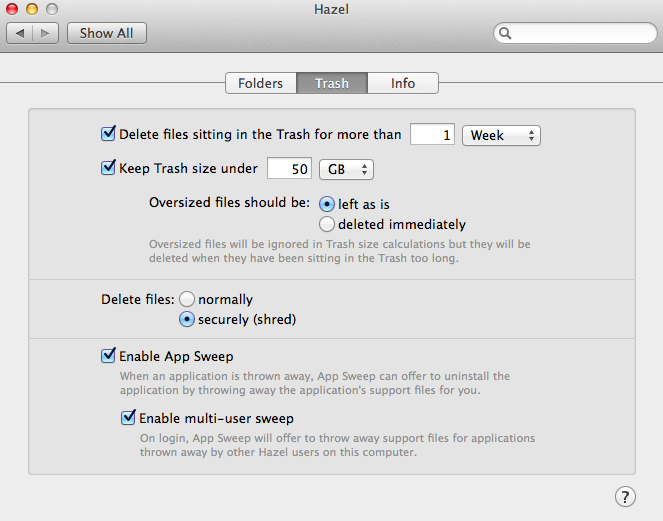 Not just restricted to Trash, Hazel can also keep an eye out for when I delete Apps, and offer to clean up the residual files that get left behind. If you later change your mind, and reinstate the application after deleting it, Hazel will offer to reinstall all of the associated preferences files for you! Hazel keeps things ticking over, without me needing to worry about the little details in life. Up until now I’ve really only scraped the tip of the iceberg with what Hazel can do. What I haven’t mentioned is that one of the actions that can be performed is to run an AppleScript or Automator workflow. This means that there are plenty of fairly complicated ways you can make use of Hazel if you sit down and take the time to work out the sort of tasks that would be helpful to your specific workflows. You are only really limited to your imagination (or the extent of AppleScript, anyway). Set up a dedicated ‘resizing’ folder, where any images that get dropped in will be resized by Hazel and spat out to a subfolder. 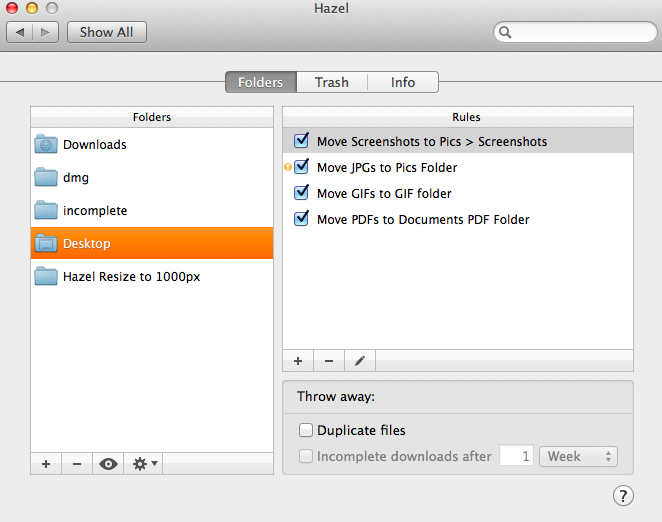 Get Hazel to organise different files into different places based on coloured ‘flags’, like learning to ignore certain files from deletion if they are flagged ‘green’. Organise PDFs saved from specific websites into dedicated folders. For example, if you download your payslips every month, Hazel can analyse the source and make sure they get put automatically into the right place. Look out for e-mails from designated people, and send them to a particular Evernote project. If you come up with any cool workflows, I want to hear from you. I know, I know. You want to employ Hazel right now. It’s understandable. You can get a free 14 day trial, or dive right in for a cost of $29 from Noodlesoft here. Scans whole files system for files ending in .zip older than 1 day and moves them to \home\Desktop\zips. Hah! You can come clean up my computer in future then.